The idea—shrinking a medical lab onto a chip the size of a small coin—is known as "lab on a chip." 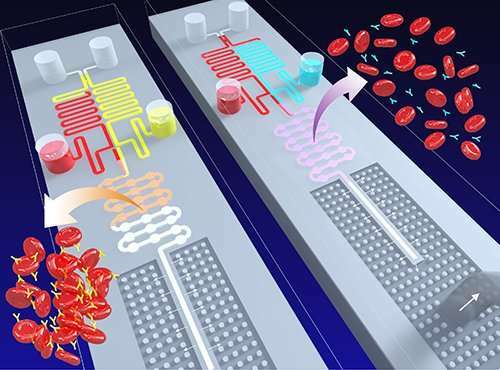 It's closer to reality than you might think, but obstacles remain; among them is finding an efficient and reliable way to mix and move blood and other fluids through the chip's tiny valves and pumps. "It's kind of like plumbing; we're moving fluids around and dealing with different pressures and flows. Only we're doing it on a microchip, as opposed to a house," said Kwang W. Oh, Ph.D., UB associate professor of electrical engineering and biomedical engineering, and the study's lead author. Oh continued: "The chip could become the basis for faster, more efficient and reliable lab on a chip devices. It puts us closer to using such devices where medical labs are lacking, such as the developing world, battlefields and even our homes." Oh says the device could be used for other biological and chemical assays. What's more, the new chip requires no sensors or external sources of power. That's key for medical device manufacturers, which are searching for ways to inexpensively produce disposable lab on a chip products.